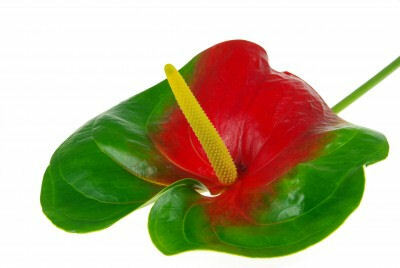 The flamingo flower (Anthurium Andraenum) is a beautiful, exotic tropical plant native to Central and South America. It produces bracts which are smooth, waxy leaves that resemble flowers. The colors range from white to pink, coral and red, with red being the most popular color. Shooting from the center of each bract, is a spadix or tongue-like cluster of small flowers. This plant is also known as the "boy plant." This plant makes a spectacular decorative accent. It is easy to care for, blooms throughout the year under low light and grows as high as 2 feet. As a cut flower, it can last for up to three weeks in a vase. Light: Anthurium prefers bright, indirect sunlight (near bright east or south window). Twelve hours or more of light a day is ideal for flowering. Water: Water thoroughly with room-temperature water and allow soil to dry slightly between waterings. If over-watered, anthurium roots may show signs of rot and leaves will turn yellow. These plants are not drought-tolerant. If watered too infrequently, growth will slow and roots may become damaged. Temperature: Keep plant in a room where the temperature remains between 70 and 90 degrees Fahrenheit. Move outside plants inside to a sheltered location if the temperatures soar above 90 degrees Fahrenheit or dip below 70 degrees Fahrenheit for more than a day or two. Tip: These flowers do not like drafts. Keep inside plants away from either warm or cold drafts. Plant outside flamingo flowers in sheltered locations if your area is prone to cool breezes. Humidity: Mist leaves regularly with warm water to keep the plant clean and moist. Place on pebble trays filled with water or moist gravel to raise relative humidity. This plant suffers when the humidity level drops below 50 percent. The leaves lose their shine and droop. Fertilizer: Feed with fertilizer designed for flowering houseplants. Dilute the fertilizer by half with water before applying to the plant. Feed once every two weeks in the spring and summer but suspend fertilizing in the winter. Too much fertilizer causes leaf burn and may inhibit blooming. Tip: Leach away salt and mineral buildup from potted plants once a month by watering thoroughly to allow water to run freely through the bottom of the pot. Flamingo flower plants are sensitive to salt in the soil. Soil: Plant in a well-draining humus-rich soil that drains well. Plant flowers in a pot with a hole in the bottom to allow for drainage. Place the plant in a potting medium of peat moss. Mix perlite, pine bark or gravel with the peat moss to provide additional aeration. Cover the roots with the potting medium and re-pot the plant once roots grow to the bottom of the pot. Flamingo lily, as it is sometimes called, contains calcium oxalate crystals which are toxic. All parts of the plant are poisonous and will cause severe pain to the mouth if ingested. It may also irritate skin, eyes and mucous membranes, so consider wearing gloves while potting or working with plant. Keep out of the reach of small children and pets.